Women in the Scriptures: Understanding what it Means to "Preside"
Several months ago in Sunday School we had a lesson on marriage taught by an instructor who had been a helicopter pilot in the Vietnam War. He gave an example that helped me better understand what it means that men "preside" over the church and in the family. The teacher explained that whenever he would take a helicopter out on a mission the most important person for him to have was the co-pilot. 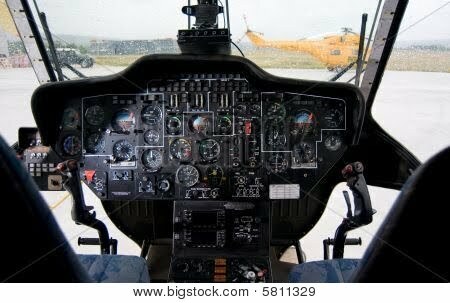 The co-pilot's job was navigation, while the pilot's job was the manual flying and the overall safety of the helicopter. He stressed that just because the co-pilot had a "co" in front of his title it didn't in any way diminish his importance or contribution to the helicopter. The pilot and the co-pilot both had different jobs but both were vital to the flying of the helicopter. He also stressed the point that the co-pilot had to have exact same abilities and skills as the pilot did. If the pilot was unable to fly the helicopter for any reason, the co-pilot would need to (and would be qualified to) step in and fly the helicopter home to safety. In another mission the "co-pilot" might actually be designated as "the pilot" but that it was important for the saftey of the helicopter that there be someone designated for each mission as "the pilot" ( who held the keys and was accountable for the helicopter) while someone else was designated as the "co-pilot" for the mission, possessing equally important (but different) responsibilities. Even though it is the pilot who has the keys, turns on the helicopter, and is responsible for the manual controls he is not flying it alone. He is working in tandem with his co-pilot. They are flying it together. The instructor also mentioned that having a good co-pilot was one of the most important things you wanted as a pilot. No pilot wanted his co-pilot to be less skilled, less educated, or less capable than him. The pilot put a lot of trust in his co-pilot and he wanted to know that he was equally matched so that he didn't have to worry about the other half of the responsibilities or the safety of the helicopter. Then the instructor said one last thing that I have been mulling over in my head ever since. He explained that no matter how the mission went, what happened or didn't happen, who was killed or lost, or how beat up the helicopter got the pilot was the one who was ultimately held responsible for the overall safety and mission of the helicopter. He said that at the end of the mission when the General asked for a report it was the pilot's responsibility to give it and to be held accountable for his overall stewardship over the helicopter. This didn't mean that the others in the helicopter weren't also held responsible, they were and could be rewarded or punished based on how they fulfilled their responsibilities. Yet, in being designated as "the pilot" for that mission and being given the keys to the helicopter the pilot was ultimately the one individual held accountable for the safety of the helicopter, its occupants, and the fulfillment of the mission. I've been thinking a lot about this instructor's analogy. In my younger years I was often confused or frustrated by the scriptures that talk about how women are to submit to their husbands or that men are to preside in the family and in the church. Sometimes those words just seemed to rub me the wrong way. Yet I've received many tender mercies of understanding throughout my life about men and women's roles and I feel like this instructors analogy was another one because it really helped me to understand the word "preside". "By divine design, fathers are to preside over their families in love and righteousness..."
" There is not a president and vice president in a family. We have co-presidents working together eternally for the good of their family . . . They are on equal footing. They plan and organize the affairs of the family jointly and unanimously as they move forward." God doesn't want marriage, or His church, to be a dictatorship by men but expects that decisions will be made with both the input and equal consideration of both men and women's voices. Men and women are spiritual equals in the home and in the church. Yet it is confusing to understand how a marriage can be equal when one of the members is suppose to "preside." "No power or influence can or ought to be maintained by virtue of the priesthood, only by persuasion, by long-suffering, by gentleness and meekness, and by love unfeigned; kindness, and pure knowledge, which shall greatly enlarge the soul without hypocrisy, and without guile.."
Other definitions of "preside" that I have heard are "to cherish", "to stand in front of", "to watch over." These meanings are easily observed in LDS church services when the man who presides over the meeting is usually not the one to conduct or to lead the meeting, his job is mainly to sit in front of the congregation, to watch over it, and make sure that their spiritual and physical needs are being met. The story of Adam and Eve also gives us greater understanding into what it means for men to preside. After Adam and Eve had partaken of the of the fruit of the tree of knowledge God realizes that something has gone wrong and he first calls on Adam, to whom he had given the stewardship of the earth, to explain what has happened. "And the Lord God called unto Adam, and said unto him, Where art thou? And he said, "I heard thy voice in the garden, and I was afraid, because I was naked; and I hid myself." And He said,"Who told thee that thou wast naked? Hast thou eaten of the tree, whereof I commanded thee that thou shouldest not eat? In response Adam does not try, as some believe, to dodge responsibility for what happened and place the blame on Eve. Adam merely gives the Lord a true account of what happened. Then the Lord turns to Eve and asks her for an account of what happened. He holds her responsible for her choices. Again, Eve is not trying to pass the blame she is telling the Lord what happened-- that she took of the fruit knowingly but that she had been beguiled by the serpent. The Lord then sees that it was Satan, disguised as a serpent ( which is a symbol of Christ), who is to blame. And the Lord God said unto the serpent, Because thou hast done this, thou art cursed above all cattle, and above every beast of the field; upon thy belly shalt thou go, and dust shalt thou eat all the days of thy life:And I will put enmity between thee and the woman, and between thy seed and her seed; it shall bruise thy head, and thou shalt bruise his heel. After punishing the serpent God then gives Adam and Eve several great promises, which as I have written before were really not "curses". Both Adam and Eve were accountable for the choices they made and both received the consequences for them. Yet, it was Adam who was called before the Lord first to give an account of what had happened. Just like a helicopter pilot being called before the General, Adam had been given a very specific stewardship over the earth and was accountable before God for the overall welfare of it. Adam, like all men after him, is responsible for the work of spiritual re-birth, which includes the saving ordinances of the gospel, priesthood leadership, missionary work, and ensuring the safety of the family. These are all stewardships that have been entrusted to men and for which they will one day be held accountable before God for. They can't pass that stewardship off to anyone, not even their wife. But that doesn't mean that men "lead" or are "in charge" in the family or in the church. Men and women are working together to fly the same helicopter, to reach the same goal ("to bring to pass the immortality and eternal life of man") and the only way we will land it safely is if we understand our individual stewardships and work together as equal partners. Is there a way that we can embrace that beautiful truth rather than feel threatened by it, and help the men who have been chosen to preside--- for this mission at least-- understand and live up to their responsibilities? This was so wonderful. Thank you so much. This was timely. I'm wondering, however, if the men understand their role this way, or if we're just trying to placate ourselves when too often "presiding" gives men justification to control and deny women their rights to self-determination because they see the role differently? I think that there are men, in an out of the church, who understand presiding by the wordly standard. Who use it as a way to gain power and unrighteous dominion over others, but that is something that is a cultural construct and is not the way in which God sees the role of men to preside. I feel like there has been a TON of talks by general authorities the last several years addressing, from many different angles, the role of fathers and men in honoring their priesthood resp. and presiding in righteousness. I think that there are places in the church where this is probably a bigger problem (where their is a culture of machismo, etc) But I feel like in my own life most of the men I encounter are striving towards using their presiding responsibility in a righteous way. It is a big resp and I think that the world does a good job of confusing us as to what men's roles really should be. I think that presiding is one of those things that everyone, men and women, need to understand better and from a more gospel perspective. Very nice, Heather. I just want to say that men do and can "lead" and are "in charge," of the family and church, but so are the women (just in case anyone out there interprets that sentence as men aren't in charge or they don't lead. Does that make sense?). In answer to Gudridur's question about do men understand this differently, I'd guess that some do, and I even thought my husband might feel some sort of superiority. When we've talked about it, though, the last thing he wants is to feel superior to someone else (me). He married me so we could be a team and both pull our weight, not so he could be better. This post is great and echos a lot of the thoughts I heard at a BYU Education Week class on the patriarchal order. He basically explained it the same way - but I wish he had used the helicopter pilot and co-pilot analogy. That was awesome. I have been thinking a lot lately about equality and unity, and I have been having this thought that men and women will never be equal the way we want them to be, because true equality for men and women, I think, only comes when they are perfectly unified through celestial marriage. And when they are unified, and "one flesh", neither is more than the other in the relationship - they are completely equal, even though they are still distinctly male and female. Great article. Thank you so much for your insights! If the pilot is the one who is held accountable for the safety of the crew, does that men that husbands are ultimately held responsible for the spiritual fate of their wives? No, individuals are responsible for their own choices and their own spiritual fate. Remember that God held Eve accountable for her choices apart from what Adam had done. But it does mean that God will ask a husband for a report about his family, which includes his wife, and that he will have to be responsible for how he fulfilled his stewardship to them. He can't control (nor should he try) the choices that they make, they are accountable before God for their own spiritual welfare. Thank you so much for this analogy! It is so nice to have a visual explanation of what I believe. Wonderful!.. BTW- can I reference you in my own blog? I have a series I do about analogies and would like to add this one. I think this analogy is really interesting. I like how this highlights that men and women have equal skills and importance, just different stewardships. Thank you for sharing! I loved this post! Thank you for sharing. I passed it along to my husband and some other family members. This was so helpful!! Thanks a million!! This will be perfect for my sunday school lesson with the youth.